Most species of Drosophila are nuisance pests, attracted to overripe fruits, on which females lay their eggs. 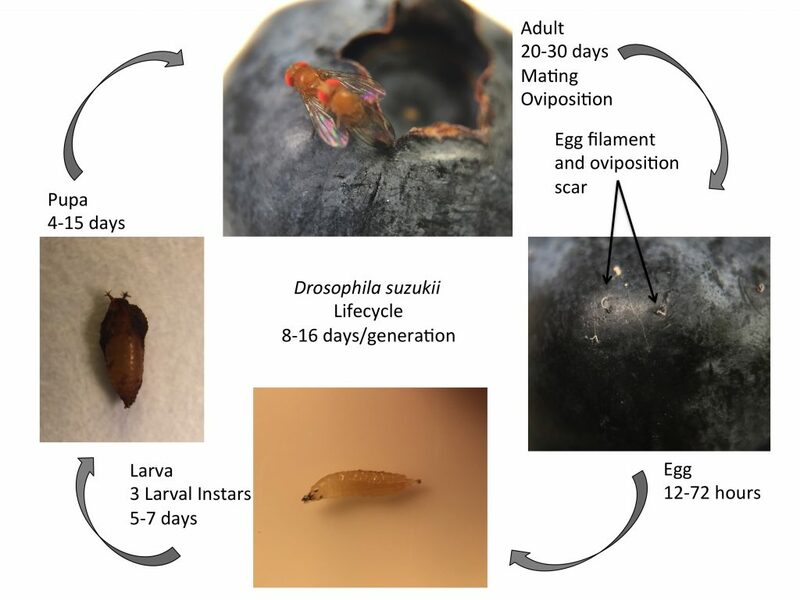 Drosophila suzukii is unique, in that they are attracted to ripening or ripe fruit, and the female is able to penetrate the skin of ripe fruit with her serrated ovipositor to lay eggs inside the fruit. Adults are small (15-30mm), with red eyes, and with unbroken black striped on the abdominal segments. The main identifying characteristic of male flies are the single black spots that are present on the leading edge of the wing, towards the wing tip. Females do not have spots on their wings but do have a prominent saw-like ovipositor that can be used to distinguish them from other Drosophila species. (See “Identification” section for more information on how to ID SWD). The larvae hatch and feed on the inside of the fruit causing the fruit to be unsuitable for market. Larvae are tiny, cylindrical and white maggots with black mouthparts. They can be found feeding inside the fruit. Pupation occurs anywhere on the inside or outside of the fruit, and development time to adult varies with prevailing temperature conditions. Females can lay more than 25 eggs per day and can have up to 13 generations per year. This leads to a large increase in the population during the crop-ripening season, peaking towards the end of the season. The adults appear to be able to disperse easily, as evidenced by the rapid spread of SWD in North America and Europe. Please see “Identification” section, which includes pictures, an ID card and a dichotomous key for help identifying Drosophila suzukii. If you are looking for additional resources then you can visit the websites below or download the following booklet: Guide to Drosophila suzukii. For now we only have this available in Swedish. Source: Asplen et al. (2015) Invasion biology of spotted wing Drosophila (Drosophila suzukii): a global perspective and future priorities. Journal of Pesticide Science 88:469-494.